Lower back pain (also referred as low back pain) is awful and nobody wants to go with it. It restricts our movements and becomes an obstacle in doing daily jobs. The prevalence of lower back pain has a shocking presence. It affects nearly everyone at some point in time. Usually, people with nonspecific lower back pain get back to their normal routines without any treatment or advice. But, if it turns to be an acute or chronic pain treatment and professional advice is required to ease the pain. However, it is not always possible to identify the real cause of low back pain: But some of them could be your poor posture while sleeping, sprains or strains, stress in joints. The pain can also be due to certain medical conditions like displacement of bone in the spine, swelled joints in your spine, broken spine bone, infection and even cancer. Acupuncture is a Chinese practice of treating pain by balancing energy flow among key points of one’s body called strategic points. This ancient practice is said to be evolved 2500 years ago with nearly no known potential side effects. The practice improves the health of one’s body and promotes natural healing. Many clinical studies find that acupuncture is helpful in treating varieties of pains associated with common musculoskeletal problems. While acupuncture has found its place in treating varieties of pains but for lower back pain the studies are not conclusive. There are mixed responses. Mr. Marcus Webb is an acupuncturist, osteopath, and naturopath who has 30 years of clinical experience in osteoporosis and chronic pain management finds modern acupuncture safe, relaxing and effective. He also correlates between the back pain and your sitting posture and recommends correct posture to prevent back pain from occurring. According to Dr. Brent A. Bauer, M.D. acupuncture does not have any proven scientific evidence to treat lower back pain in patients. But many patients report they have got the relief from chronic lower back pain after acupuncture. 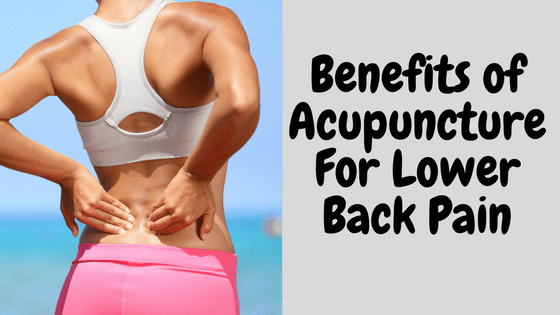 Also, many studies find the beneficial effect of acupuncture in relieving back pain than no treatment. He recommends trying acupuncture if no other treatments have worked for your lower back pain. What are your thoughts about trying acupuncture for relieving your lower back pain? Please share it in comments. Previous Post Smart and Easy Ways of Using Pumpkin Seed Oil for Hair Growth Next Post Is Honey Good for Weight loss? Hi there – great tips on improving your health, especially the tips on how to use acupuncture to deal with pain. That’s something I’ve been wanting to try!